Men's flat top hats are the ultimate biker hats. Get one today and have the ideal accessory to put on the second your helmet comes off. 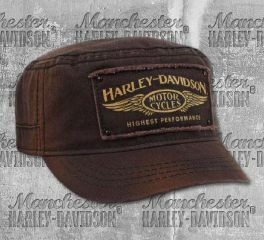 Harley-Davidson® Men's Brown Highest Performance Painters Cap is made from 100% cotton ripstop. It features an adjustable closure and Harley-Davidson® patch on front. Perfect for simple man out there. Harley-Davidson® Men's Bar & Shield® Khaki Painters Cap is made from 100% cotton ripstop. It has an adjustable closure for desired fit, perfect for a simple man out there. 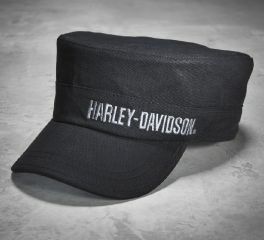 Top off your ride with a H-D® flat top cap for a look thats traditional turned modern rebel.